Apple head Chihuahua, What Is It? What is an Apple Head Chihuahua? I get asked this question a lot, a Apple head Chihuahua is not a different breed of Chihuahua. In all reality it is simply a term used to describe the shape of a Chihuahuas head. There is only one Chihuahua breed but there are two different breed types. Long hair or Short hair and either can have an apple head. The American Kennel Club set the Chihuahua breed standards for the shape of the preferred head. The term apple head is required in the description of the ‘head’ of a Chihuahua that includes "A well rounded "apple dome" skull, with or without molera". So that’s the bottom line here, the term apple head is used to describe any Chihuahua with a round or ‘dome-like’ head similar to the shape of an apple. The upper part of the Chihuahuas’ skull is wider than the lower part in the jaw area. The Apple head Chihuahua has a easily recognized distinctive head which make their large eyes look more pronounced as do their long erect ears. They are very adorable to look at and generally smaller in size. 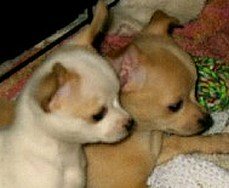 As a Chihuahua breeder I use it when referencing any of my Chihuahua puppies at the age where it is noticeable. The other term you may have seen that relate to Chihuahuas’ is “deer head”, a term used to describe any Chihuahua that does not have the characteristic apple shaped head. Whether you choose an “apple head” or a “deer head” is simply a preference, both are awesome adorable little dogs. The shape of their head does not affect their personality in any way. Many breeders exclusively breed for the apple shaped head especially if they are breeding for show dogs, a must have characteristic for the show ring. If you are looking for show quality an “apple head” as well as other standards set by AKC will be your best choice.